what do you think of this walker / arm attachment? Hey abacoian, that looks like a pretty good walker! The reviews are good and it looks like it's built well. Do you think your legs are strong enough for this? It'll definitely be a great tool to help build strength. I have a older walker like this but it does not have the arm rests, I would need to purchase them. I'm hoping the arm rests would add some support to my upperbody if my legs stumbled. I have practiced with this walker before and managed taking steps, my main issue is only being able to practice with someone behind me step for step. I'm hoping the arms will add enough security to allow me short unassisted walks through the house, at least to start and then maybe more.I think I just need to get them when I can afford to and try them out. I haven't seen the armrest before but my first thought was I'd need one for each side. As DJ said leg strength would be the issue. They look more stable than forearm crutches alone, but I can't picture moving. If no spotter available I'd keep working from the floor or chair, be safe, no sense putting yourself at risk for another injury. You were looking at some safe parallel bars and if you have them it would be safer to walk the walker within them. One more chance to catch yourself. You have the drive to do this you can tell from your posts. Play it safe. abacoian I've seen people using this kinda walker at my physiotherapy clinic and its definately more supportive than the regular walkers. 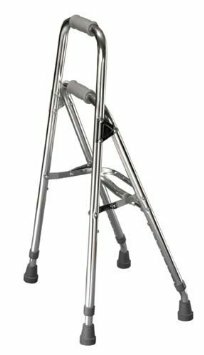 Have you practiced with this walker with the supports or the regular one? If you needed a spotter when using the walker with arm support, I don't think it's a good idea to try it out on your own. Like kilg0retr0ut said, you definately have the drive and motivation but you have to be careful how much you push yourself! I think maybe a long time ago I used a similar walker in therapy but can't remember. Apart from my up n free trainer the most recent walker I've used is a standard one without those arm supports. I agree with being careful. But I have found things that it seems too difficult to try with some risk, that if I feel like I can do it and try, it is difficult but usually with effort it can be done. Trust me, I am careful and listen to my limits and use caution. I think that kind of walker would be beneficial for me, but maybe I'm not quite there yet. I have several ideas that I think would be beneficial, but at the moment I'm just keeping my regular routine going because it has been good for me. I hope to post sometime my other ideas and get feedback on what direction would be best for me to go in. Thanks for listening guys and keep at it. It's great seeing how motivated you are abacoian and it's also good to hear that you know your limits. Keep sharing ideas when you have them for sure! Another thought...I notice that many have thier walker settings too low. Not only does this cause one to stoop, it causes too much reliability on the arms. A higher walker setting will not only encourage leg strength, but in those moments of needing support, it's there. I've noticed that as well faery. A higher setting like you suggested would be better all around! Had to google it to find out. I've never seen one before! hmm, I don't think I'm there yet:) Hopefully one day!